Along with many other people, I’ll spend hours flying with young children this holiday season to visit family and, like many parents, I’d do anything within reason to keep my young children busy on a crowded airplane. The iPod Touch offers the best options for young kids. I’m a big fan of old-fashioned analog activities—books and crayons—but they’re not enough when you’re cooped up for six hours on a plane. In advance of a cross-country flight on Wednesday, my two kids and I spent several days trying out the most versatile and convenient gadget—offering movies, games and other electronic media—for keeping us entertained. We looked at Apple’s iPod Touch, a Sony (SNE) PSPgo and a Nintendo DSi. Sony and Nintendo have updated their PlayStation Portable and DS game players with features aimed at going beyond traditional gaming. 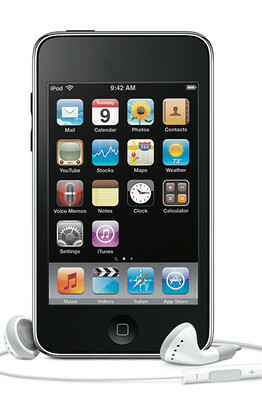 Apple (AAPL) is been promoting the iPod touch’s game capabilities. Nintendo has done a lot to push the boundaries of gaming, with the Wii and other products. But the $169.99 DSi isn’t the entertainment Swiss army knife the iPod Touch and PSPgo are. It doesn’t play movies, for example—a big minus for my 2-year-old son, who is too young to be patient with most games. It’s still a fun game-player, though, with popular titles for young kids, including two that are big with my 6-year-old daughter: the Nintendogs virtual pet and Pokemon adventure games, which run about $30 a title. One big change Nintendo made to the DSi is the addition of two cameras that are used in fun games, like the ones that put a player’s photo alongside other characters. One simple camera application lets you distort and doodle on images. Nintendo and Sony also have followed the lead of the App Store—Apple’s online clearinghouse for iPhone and iPod Touch software—by letting users download software directly to the DSi and PSPgo over a Wi-Fi connection. It is more convenient than keeping track of a lot of external game cartridges and discs. Compared with the more than 100,000 titles in the App Store, however, Nintendo’s DSi Shop is sparsely stocked. It had only two free applications and about 90 titles, mostly costing $2 to $8. One free DSi titles, Flipnote Studio, was a huge hit with my 6-year-old. It let her create an electronic version of an old-fashioned flip book, where you animate sketches by flipping pages. The DSi has only 256 megabytes of built-in storage, good for about a dozen games, though users can expand that with a storage card. With the $249.99 PSPgo, Sony got rid of the old proprietary disc format for movies and games used in older PSP models, replacing it with 16 gigabytes of built-in flash storage onto which users can download games, movies and other content. The change allowed Sony to make a sleeker device with controls that slide away under its crisp color display. The iPod Touch is still slimmer and easier to tuck into a pocket. A model with eight gigabytes sells for $199, while one with 32 gigabytes sells for $299. The PSPgo’s display is slightly wider than that on the iPod Touch, but isn’t touch-sensitive. Still, the PSPgo and iPod Touch are fine for watching movies. They’re more convenient on airplanes than fumbling with a laptop and DVDs. And users can wirelessly download movies and games onto the PSPgo from Sony’s online PlayStation Store. I found it faster, though, to do the transaction on my PC over a wired Internet connection, and load the material onto the PSPgo over a USB cable with Sony’s version of Apple’s iTunes application, called Media Go. Media Go runs only on Windows. Prices for movies on the iTunes and PlayStation Stores were mostly the same at $14.99 for new releases and $9.99 for older ones. Rentals are $3.99. Both stores had a similar selection of new releases, but the PlayStation Store lacked some kid titles that were on iTunes, such as “Toy Story.” There is also a directory of free podcasts on iTunes that makes it easy to download free videos to the iPod Touch, including kid-friendly material such as NASA space-shuttle landings and “Sesame Street” clips. Games for PSPgo tend to be more intricate than those for iPod Touch, but that comes at a price. While Sony sells cheaper games, many are in the $19 to $30 range. I liked an adventure game called “Little Big Planet” starring a character called Sack Boy—for $39.99. That price is steep compared with all the inexpensive and free content on the App Store for the iPod Touch. My kids liked a lot of it: a free dress-up game called “Dress Chica” and a $1.99 snowball-fight game called “Grinchmas.” My son particularly loved a free, beautifully illustrated short book called “Voodoo Doll’s Halloween Story.” My 6-year-old spent hours with a free math-drills program. I found the iPod Touch offers the best entertainment options for young kids at bargain prices. And that is a gift for parents. Email Nick.Wingfield@wsj.com. Walt Mossberg is on vacation.